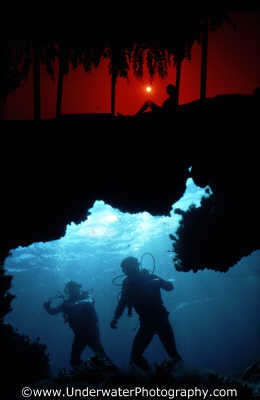 underwater Photo Course :: (5) Travel :: Why Travel? The majority of underwater photographers do not live on virgin coral reefs, in fact, most of us have to make do with conditions that are substantially less than perfect. Perhaps the mixture of absurdity, discomfort, expense, and difficulty, lie at the root of underwater photography's appeal. It's certainly true to say that you would soon get bored if you had perfect results every shot. Operating in poor (local) conditions does stand us in good stead for when we travel but can often be counter-productive in developing photographic skills. You will find (if you haven't already) that your percentage of successful results increase dramatically when you first travel abroad with your camera. Whatever the time of year, there is always somewhere in the world with clear, warm water and co-operative subjects. What a marvelous proposition, as long as you've got the cash, you and your underwater camera can be there! Next >> Where to Go?